* What is My Brother’s Keeper (MBK)? 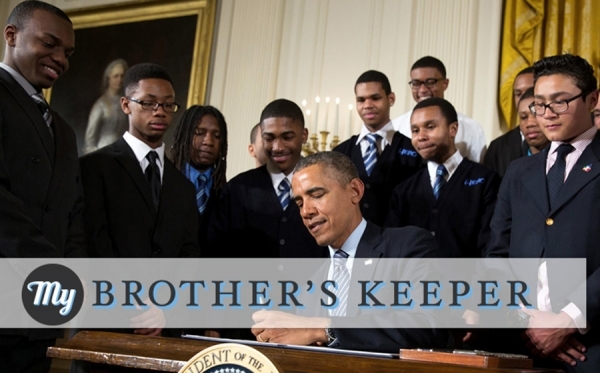 My Brother’s Keeper is an initiative created by President Barack Obama in February of 2014 to address the disparities that boys and young men of color are faced with on a daily basis. This population is ranked least likely to graduate and succeed in life as evidenced by 23.3% of Hispanic & Latino Americans, 25.8% of Black Americans, and 27% of American Indian & Alaskan Native Americans (AIAN) currently living in poverty, compared to 11.6% of White Americans, according to the My Brother’s Keeper Task Force Report given to the President in May of 2014. This report highlights a great many facets about the challenges this population must struggle against and overcome to be successful. * How is Sanford connected to the MBK Initiative? - When this initiative was placed into action in 2014, the President of the United States challenged the communities of the nation to adopt six milestones and to locally improve the outcomes for their boys and young men of color. All children should have a healthy start and enter school ready – cognitively, physically, socially, and emotionally. All children should be reading at grade level by age 8 – the age at which reading to learn becomes essential. All youth should receive a quality high school education and graduate with the skills and tools needed to advance to postsecondary education or training. Every American should have the option to attend postsecondary education and receive the education and training needed for the quality jobs of today and tomorrow. Anyone who wants a job should be able to get a job that allows them to support themselves and their families. All youth and young adults should be safe from violent crime; and individuals who are confined should receive the education, training, and treatment they need for a second chance . One of the local Clergy, Pastor Lowman Oliver and a local businessman, John Wright following the My Brother’s Keeper initiative contacted the City of Sanford, expressing their concerns of the dropout rates of youth of color and their continued over-representation in the criminal justice system. The City researched the initiative and appointed Andrew Thomas, the Community Relations and Neighborhood Engagement Director, to develop an exploratory committee into My Brother’s Keeper. This committee evolved into what is now known as the Sanford-Future Claimers (SFC). The SFC started as 13 individuals from various youth and faith-based organizations to explore the challenges that young men of color face in Sanford. On March 23, 2015, the City of Sanford approved a resolution to become a "My Brother’s Keeper Community". One month later, on April 18, 2015, the official launch of this initiative was unveiled at a Community Summit. The SFC is now comprised of more than 30 representatives from faith-based organizations, non-profit and for-profit organizations, community leaders, higher education, and local, county, and state officials, as well as volunteers in working together to use existing resources to support the MBK initiative. The Sanford Future Claimers work in unison to end the disparities that exist here in Sanford and to promote the success of young men of color. In November 2015, the SFC held their second Summit to introduce their Local Action Plan to the community, addressing the challenges faced in Sanford by young men of color. To view and download this plan, follow this link: SFC MBK Local Action Plan. * Where do we go from here? On March 2, 2016, the SFC worked with Seminole High School and Journeys Academy to bring 20 young men of color to National Lab Day at Kennedy Space Center (KSC). This was a special event created by National Labs to introduce young men of color from around the country to the Science, Technology, and Engineering and Mechanic (STEM) programs existing at these labs. The Sanford-Future Claimers meet monthly to discuss how our community will pave the way for our young men of color to succeed beyond high school and into a prosperous career. If you are interested in becoming a stakeholder with the SFC or would like to know more information about My Brother’s Keeper initiative here in Sanford, please contact Andrew Thomas via email at andrew.thomas@sanfordfl.gov or call (407) 688-5132. If you are an employer interested in learning about federal resources to assist in youth employment, follow this link: Pathways for Youth Employment Handbook. * The Future of My Brother’s Keeper. There have been questions circulating about the future of this initiative and whether the program will continue after President Obama leaves office. The Sanford Future Claimers are confident it will. On May 4, 2015, President Obama helped launch the non-profit organization “My Brother’s Keeper Alliance,” which took ownership of the MBK initiative. To view highlights from the launch, follow this link:MBK Alliance highlight video. To view the MBK Alliance Vision, follow this link: MBK Alliance Vision. It is the City’s expectation that successful implementation of evidence based programs to support boys and young men of color will lead them to graduate from high school and move forward into college and successful employment.